Boys will grow their strength and learn basic core skills, necessary positions and support holds in boys gymnastics for 5 to 9-year-olds. A strong emphasis is placed on building strength, increasing flexibility and improving coordination through gymnastics equipment and the Ninja Warrior obstacle course. Boys will utilize specific equipment like the bars, vault, rings, and tumbling floor. They will also have a good time flying on our Zipline. Classes are eight boys per coach. Boys Hot Shots is an invitation-only boys gymnastics class. Our coaches are constantly evaluating their students to make sure each child is being challenged in the class. 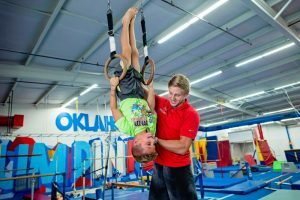 If a coach thinks a child is ready to move up to Hot Shots from their boys gymnastics class, the coach will let the parent know that it is time to move up a level.